OnePad is currently on hiatus. Support is still available to existing customers. Q: Can I secure my notes with a password? OnePad does not offer separate password protection from what is built into iOS. If you want to keep your notes private and you share a device with other users OnePad is probably not a good fit for you. Q: How do I back up my notes? Your OnePad notes will be backed up with the rest of your device's data when you back up to iTunes or iCloud. However, that data cannot be restored without restoring everything on your phone. By regularly exporting OnePad archives you can always be sure your notes are safe and ready to restore to any device without effecting your other apps. Please see the next two questions for details on exporting a OnePad archive. Q: How do I export my notes? To export your notes tap the current date at the top of the page. The date picker will appear and the action button at the top right will change to a paper airplane. Tapping the action button now will display the export options menu. Q: What are the export options? There are four export options. You will need to have at least one email account configured on your device to use the email export options. This option will prompt you to open the current note in any other app you have installed that supports text files. You can use this option to send a note to another editor or save it to your Dropbox. This option will open a new email message with the text of the current note inserted into the body. This option will open a new email message with all of your notes attached as a single text file. This file can be opened in any application that understands plain text. It includes basic Markdown formatting so you can generate a simple HTML file from it if you want. This option will open a new email message with all of your notes attached as a OnePad backup archive file. 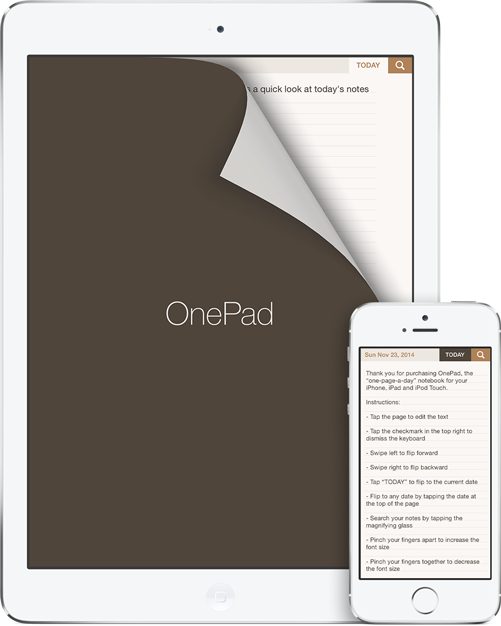 Opening this file on a device with OnePad installed will allow you to restore your notes. Q: How do I change the UI color? Tap the date at the top of the page and use the slider control above the date picker to adjust the interface hue. Q: How do I change the size of the text? You can change the font size at any time by pinching with two fingers anywhere on the page. Pinch together to make the text smaller. Pinch apart to make the text bigger. Q: Are there any settings I can customize? To access the settings, exit OnePad using the home button and open the Settings application on your device. Scroll down to find the OnePad menu item. Q: What are the settings and what do they do? This setting allows you to pick from three formats used to display the current date. This setting allows you turn the page lines on and off. This setting allows you toggle between the standard page flip and slide interactions. This setting requires an app restart to take effect. With this option on, OnePad will automatically skip any empty pages when flipping back through your notes. You can still access any date in the past using the datepicker. Q: I still have questions, or I'm having a problem. Can you help? Of course! Please feel free to contact me for support. Starting with OnePad version 1.4.1 you can use the the OnePad URL scheme to launch OnePad or automatically add content to a date. Dates should be in the format YYYY-MM-DD and text should be percent encoded. I'd like to thank everyone who bought OnePad, helped me test a new release, was patient when there was a problem, wrote me a kind email or left a glowing review. OnePad is a Retrobit Operation. © 2012-2015 Retrobit LLC.